Sky will launch its dedicated 3D television channel, called simply Sky 3D, in April, with Sunday's Arsenal v Manchester United match being screened in 3D in selected pubs as a special preview to the service. The Arsenal / Manchester United clash will not only be a fitting introduction to 3D television, but also make Sky the first TV company anywhere to broadcast a live 3D TV sports event to a public audience. "2010 is the year for 3D TV," said Gerry O'Sullivan, Sky's Director of Strategic Product Development. "People have already embraced 3D cinema and because Sky's 3D service uses the same kind of technology, we're confident there will be demand for sport, movies, concerts and drama in 3D." Nine pubs – located in London, Manchester, Cardiff, Edinburgh and Dublin – have been kitted out with 3D-ready TVs and by April 'hundreds' more pubs will be set up to take advantage of the Sky 3D channel launch. According to Sky, the Sky 3D channel will arrive for consumers "later this year". "Once 3D TVs begin to reach the consumer market later this year, Sky will then make Sky 3D available to all Sky+HD customers, giving millions of people the opportunity to watch a wide range of content in 3D, including movies, sport, documentaries, entertainment, and the arts," confirmed Sky's release. The service will work with all existing Sky+HD boxes and will 'initially' be introduced as a bonus for anyone with a Sky+HD subscription who also has a 3D capable television. "The good news is that all Sky+HD customers already have the set-top box they need to enjoy 3D, meaning they simply need to buy any new 3D TV, all of which will work seamlessly with Sky's ground breaking new service," added O'Sullivan. 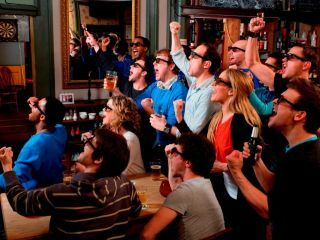 So, Sky 3D coming to a pub near you in the coming months – although we're not entirely sure how many pints you'll have to buy before the landlord gives you your own pair of 3D glasses.